Not to be confused with Santa Rosalita, a town on the Pacific Coast in Baja California state. 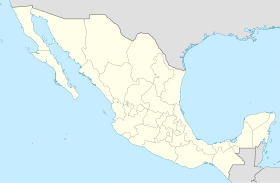 Santa Rosalía (Spanish pronunciation: [ˈsanta rosaˈli.a]) is a town located in the Mulegé Municipality of northern Baja California Sur, Mexico. It is on the Gulf of California coast of the Baja California Peninsula. As of 2015, the town had a population of 14,160 inhabitants. It was once a company town. Santa Rosalía is a port city, and a regular ferry connects with Guaymas, Sonora, on the other side of the Gulf of California. At the Palo Verde Airport daily flights are available from Guaymas and twice a week from Hermosillo, Sonora. It is located along Mexican Federal Highway 1. The town was named after Saint Rosalia, although the reason for the name is not quite clear since the Misión de Santa Rosalía is not located by the town, but rather in Mulegé, about 100 km (62 mi) south, and the local parish is devoted to Santa Bárbara. Santa Rosalía boasts French influence, particularly in its architecture. The French company El Boleo founded the town in 1884 and exploited copper mines there until they closed in 1954. They built houses and installed the metallic Iglesia de Santa Bárbara, which is argued to have been designed by Gustave Eiffel. Unlike many other mining sites, the industrial facilities which are located in the very middle of the town, were never dismantled. Of particular interest are the reverberatory furnace and the metallurgical converter, although they are currently not accessible by the public due to safety concerns. Old locomotives, mining equipment and machinery are visible everywhere. The main mining company offices (La dirección) have been converted into an industrial museum. The 2015 census showed a population of 14,160 persons. The city is the seat of the Mulegé Municipality. 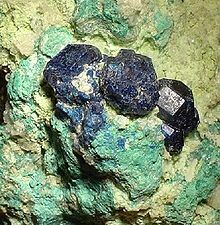 Boleite (dark blue) and atacamite (blue-green) in clay, a high-grade ore specimen from Boleo. The Boleo Mine is an unusual sediment-hosted copper-cobalt-zinc-manganese ore deposit. Seven large manto ore deposits have been identified. El Boleo was mined by Compagnie du Boleo, a French company, from 1885 until 1954. To prevent the economic collapse of Santa Rosalia and surrounding communities, a Mexican state-owned company (CMSRSA) assumed control and reopened the works using basically the same (rather archaic) equipment and process used by the French. The government funded operation was never profitable, and the mine was finally closed in the 1980s, when lower-grade ore and old technology made continued operation impractical. Baja Mining, a Canadian firm, began intermittent exploration of the El Boleo mine and subsequently undertook an effort to reopen El Boleo. Baja Mining estimated that the property contains a resource of 534 million tons of ore, containing 0.59% Cu, 0.051% Co, and 0.63% Zn. Baja also hoped to produce byproduct manganese. Baja Mining, in partnership with a Korean Consortium began developing the $1.6 Billion project in 2010. In 2012 however, construction cost overruns reported by Baja Mining threatened to halt or delay construction of the project. Majority ownership interest and control of the project was transferred to the Korean consortium, in return for funding the reported cost overruns. Construction continues, with mechanical completion and copper production targeted for early 2014. In January 26, 2015 Minera y Metalurgica del Boleo obtained its first copper production from the process of crushing, leaching, extracting and electrowinning in its mine-metallurgic project "El Boleo". Due to its location in the warm Gulf waters, which are considerably warmer than Pacific waters in the winter, the town is the northernmost (and thus closest to the US border) year-round warm locale on the main peninsular highway. Nevertheless it's not much of a tourist town and sees few snowbirds. ^ "Estado de Baja California Sur–Estacion: Santa Rosalia (DGE)". NORMALES CLIMATOLÓGICAS 1951–2010 (in Spanish). Servicio Meteorológico Nacional. Archived from the original on March 4, 2016. Retrieved February 9, 2016. ^ "Extreme Temperatures and Precipitation for Santa Rosalia (DGE) 1929-2010" (in Spanish). Servicio Meteorológico Nacional. Retrieved February 9, 2016. ^ "NORMALES CLIMATOLÓGICAS 1981–2000" (PDF) (in Spanish). Servicio Meteorológico Nacional. Retrieved February 9, 2016. Wikimedia Commons has media related to Santa Rosalía, Mulegé.